It may be you yourself who has reached your 48th wedding anniversary, or alternatively, you may be preparing for the 48th anniversary of your friends or family members. Whichever is the case, it is time to celebrate the achievement of reaching so many years of marriage. Although the 48th anniversary is not a traditional milestone year, it is still a time for showing your partner or your loved ones how much they are loved and appreciated, not only on the date of the anniversary itself, but throughout the year. One of the best ways to show your loved ones how much they are admired and cared for is to surprise them with a gift that is really meaningful and heartfelt. The more care and attention has been put into choosing a present that is just perfect, the more it will touch the heart of the recipients and reaffirm the esteem in which they are held. You may want to choose a gift that has a special relevance to this anniversary year by looking at the lists that have been drawn up linking themes with every year of marriage in order to find a symbolic present that has a special meaning. When the traditional lists of anniversary years to be linked with materials was drawn up in 1937, the 48th wedding anniversary was not featured. This was because it was not considered to be a milestone year as only every fifth year after the 20th year of marriage was included. More recently, lists have been created that are tailored to the needs and demands of more modern married couples and these have linked a material or theme to every single year of marriage from 1 to 100. The 48th year of marriage has been connected in these modern lists with optical goods, and you may wish to incorporate this as part of your idea for a 48 year anniversary gift for your loved ones. Flowers are one of the top 48 year anniversary gifts that you can choose, and is the best bet if you don’t want to feel constrained by the theme of optical goods linked with this anniversary year. As there are no traditional flowers or colors associated with the 48th wedding anniversary, you are completely free to select any shades or varieties that you or the recipients prefer. There are so many wonderful hues to choose from, you can be sure that you will find something that will brighten up their home and their lives. The downside of selecting flowers as your choice of 48 year anniversary gift is that they do not last very long. If you love the idea of a floral present for your loved ones, but want it to last longer than just a few days, why not an enduring token of esteem like a glazed Eternity Rose? Available in a huge choice of colors, your relatives or friends celebrating this anniversary year will treasure this work of art which has been produced by hand by talented craftsmen. Made from a single geniune rose blossom and glazed in a complex three month long process before being decorated with a lavish 24 karat gold trim, each item is entirely unique and when presented in its own prestigious display case made from leather it will form a long lasting and beautiful memento of this anniversary year. There are lots of different and interesting 48 year anniversary gift ideas that incorporate the theme of optical goods. 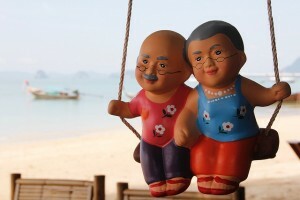 A new camera would be an excellent choice of present for a couple who love the capture their experiences and memories. The happy pair will love to use their new gift throughout the rest of their married life. Another possibility is a new DVD player or blu ray player. This clever twist on the optical device will give hours of pleasure to your loved ones and will bring their entertainment options into the 21st century. You could even surprise them with a collection of their favorite TV series and movies so that they have days of fantastic and fun viewing to enjoy. A new CD player would be an excellent choice for any couple celebrating their 48 year anniversary, especially if you present them with some of their top albums to enjoy and dance to. One of the top optical goods themed gifts is a pair of stylish sunglasses for him and her. Choose high quality designer brands that will last for many more years and you can be sure that your present will be much appreciated. For wonderfully romantic 48 year anniversary gifts for her or for him, why not arrange a star gazing experience? Cleverly incorporating the theme of optical goods thanks to the telescopes involved, you may be able to find an observatory in your local area that hold star gazing evenings so that you can spend time together looking at the stars and planets. Even if you cannot find an observatory, you could arrange your own romantic star gazing experience by buying a good quality telescope, packing a picnic and setting out at night together. What better way to rekindle your love on your 48th wedding anniversary? There can be no better 48 year anniversary gift for him or her.